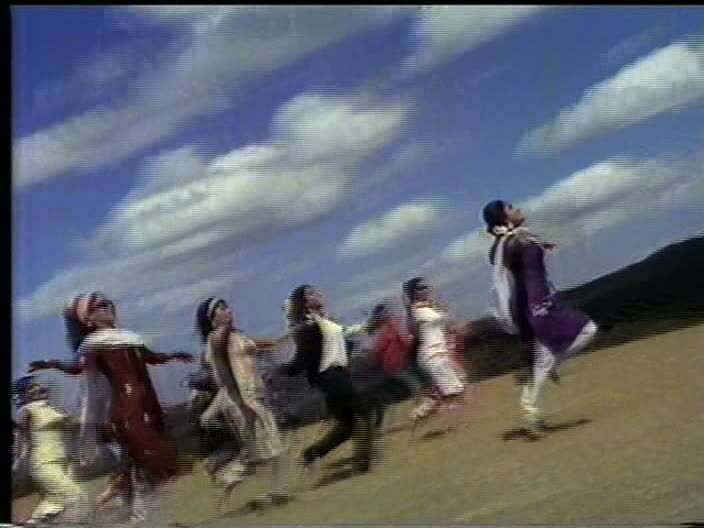 Update to post (April 9, 2010): Bollyviewer has told me that my DVD's subtitles for the song "Parayi Hoon Parayi" translate the title incorrectly as "outsider" when the real meaning is "belonging to someone else." That means my consideration of both leads being called "foreigner" or "outsider" no longer makes any sense, but I'm leaving that portion in the post just to be accurate to my viewing experience. 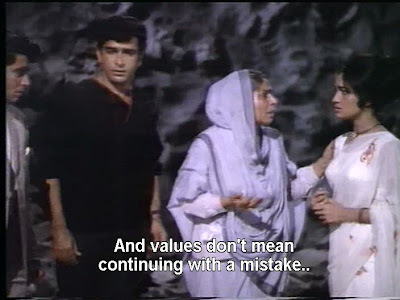 According to my own rules, I should have bailed on this movie: Shashi once again says "izzat," though this time he's talking about his own vocation rather than anything connected to the woman he loves. Phew! 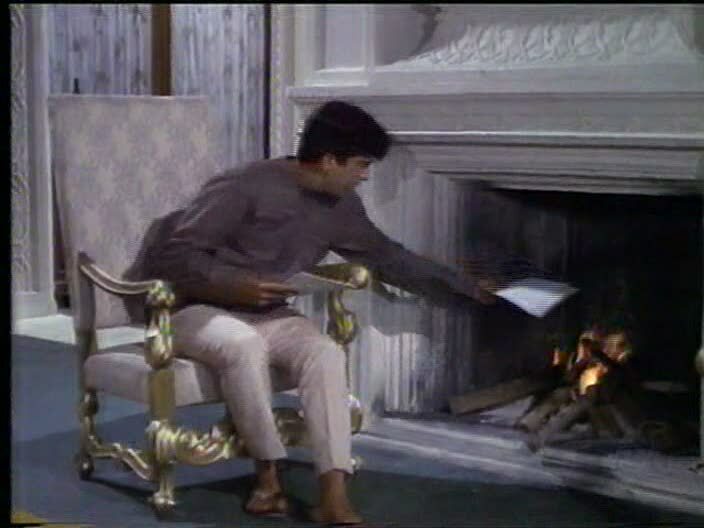 Shashi plays Amar the poet, who despite being an orphan seems to have plenty of money for big cars and doing very little work. When his car breaks down in the countryside one day, he meets-cute feisty village belle Rekha (Asha Parekh). Both are soon smitten, but he has to scoot back to the city. 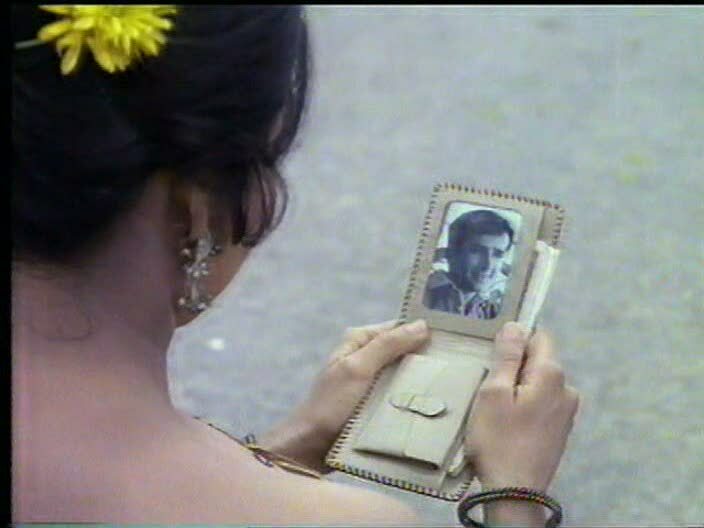 He accidentally-on-purpose forgets his wallet to give himself a reason to return, and Rekha demonstrates the what it is like to gaze fondly at a really good picture of Shashi Kapoor. He returns to the village and expresses his luuuurve in "Likhe Jo Khat Tujhe," an adorable song in which he says his love letters to Rekha turn into colors, flowers, and stars, and I swooned right then and there. and she makes some adorable faces to boot. Erin, this bottom right picture totally reminds me of you! Amar has a good friend also named Amar (Dilip Raj), who himself has a nice girlfriend, Lata (Sayeeda Khan), whom he loves so much that he throws the girls vs boys hockey match to let the women win so her confidence is increased (and then tells her about it as evidence of his love). How respectful! Even if I do not approve of his methods, I highly approve of their love song. Here's part of it. Cuteness of song is directly proportional to sun umbrellas, number of friends, skipping, and hands in the air! It's science! 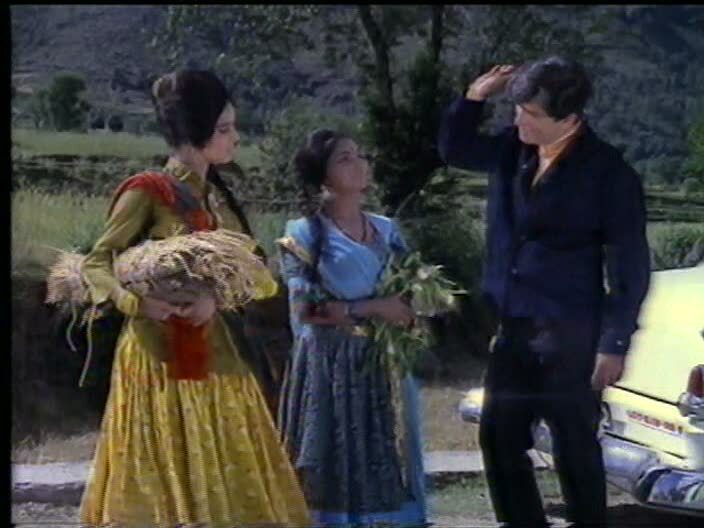 Lata and Dilip-Amar get married - after Shashi-Amar uses his wordsmithing skills to convince her father that Dilip-Amar is a worthy match for Lata - and have a baby, while Shashi-Amar remains happily single despite the protests of his household staff (Om Prakash). How convenient that it's cold enough to have a fire going (yet not have to bother with socks)! 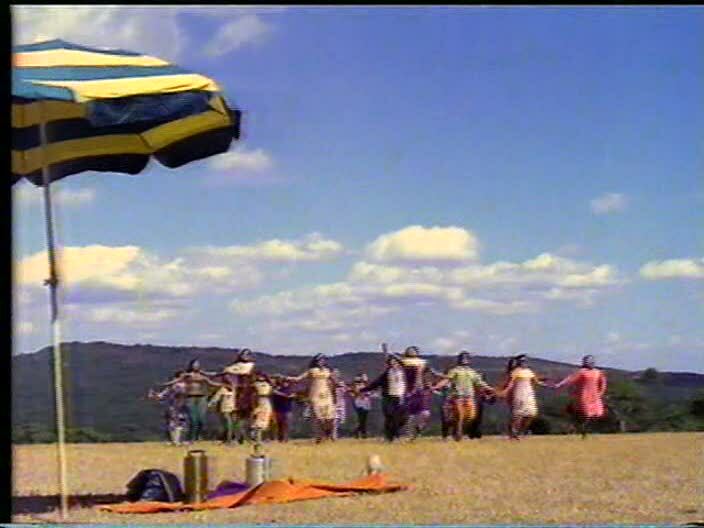 and famously imagining a miniature Rekha dancing on his desk, then multiplying, during an alcohol-fueled haze. I had no idea how the characters were going to get out of this mess and end up with not one but two happy marriages! 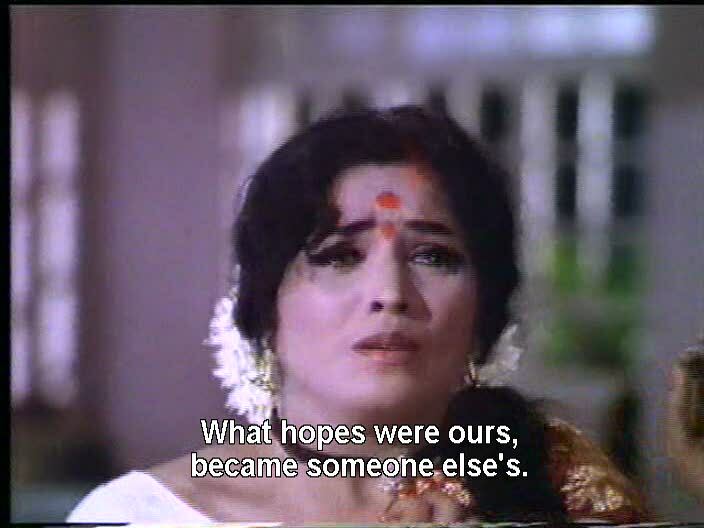 My money was on someone's death being the necessary step to clear the way for Shashi-Amar and Rekha to be happy, but given the identity of her childhood groom, that didn't seem very likely. 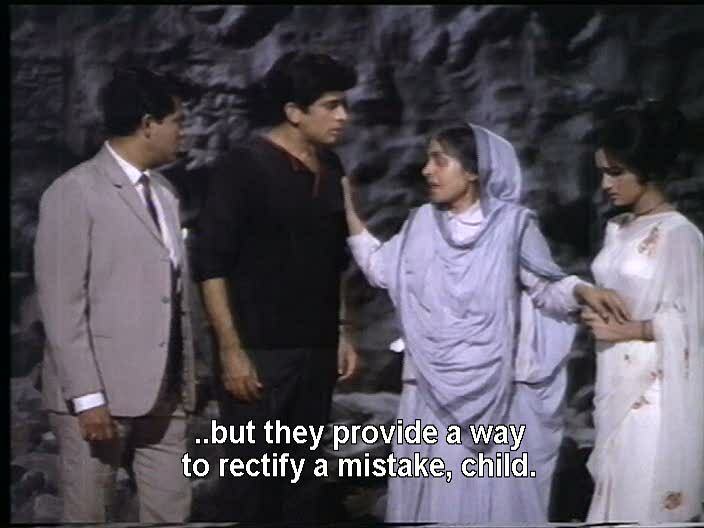 Furthermore, sending Rekha back to where she was living before the car accident didn't sound like a possibility either, even if it did make life easier for Lata and Dilip-Amar. At two points in the film, there is interesting language about both Shashi-Amar and Rekha being foreigners or outsiders. 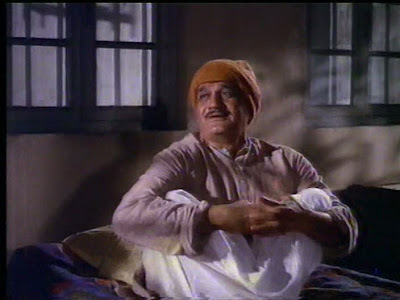 When they first meet in her village, she calls him pardesi for quite awhile; in his drunken hallucination, she sings about being an outsider who cannot be with him and that he shouldn't wait for her or feel a connection to her. He, of course, is a total outsider to the world in which she was married and cannot join either her or it; she cannot join his world because of ties elsewhere and is distressed by his pain over losing her. Surely all that language doesn't mean that they won't end up united, too different to be together? No no, that can't be it either. After puzzling through things this far, it also occurred to me that the plot obstacles in this film were exceptionally contrived and without particular emotional draw (at least for me) or contextual relevance, so seeing how the movie got itself out of such a silly situation became my primary motivation for finishing the film. Asha Parekh is largely wasted in Kanyadaan once Rekha reaches the emotional wandering phase, and I resent history for providing us with only two prime vintage Asha-Shashi pairings, both of which are in meh films. Much to my surprise, the way out turned out to be completely sensible and uncomplicated! Rekha's Maa rushes to her side as she is about to wander once again into the path of danger (a mine this time - what, doesn't your neighborhood have a blasting area?) and decides that holding her daughter to a child marriage that she doesn't want doesn't serve any real purpose, so they should just forget it and move on with what makes them happy. WOW! Not only a deus ex MAAchina but a damn reasonable one too! A useful life lesson for us all: if our values are making us unhappy while providing no one else any benefit, then it's okay to reexamine them, re-prioritize them, and think about them in a different way. There are many elements of this film that are pleasant while on screen but then quite forgettable. One major exception is the odd insertion of the rehearsal and performance of a play written by Shashi-Amar. Laxmi Chhaya is the star of the play, and before we see the play, Rekha sees her in a very passionate-looking rehearsal with author Amar. 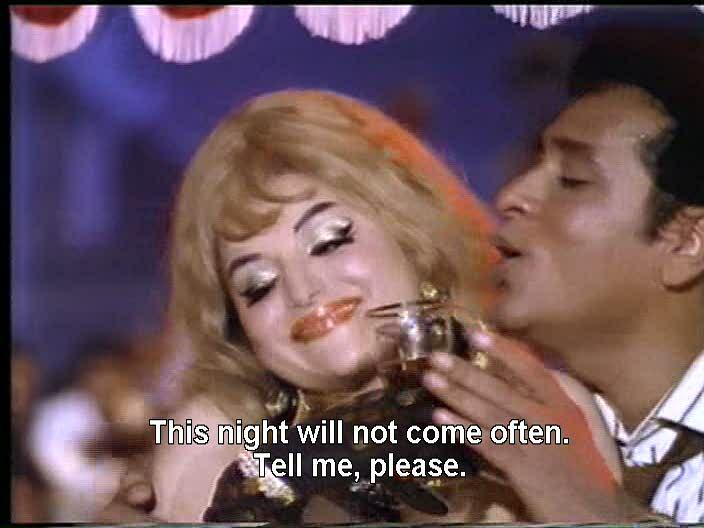 The play is a sad tale of a married woman (Laxmi) whose husband goes out carousing and brings home a much trashier model (please note her super-tacky eyeliner - the cat's-eye part does not actually connect to her lash line, sort of like this ____ ---) and kicks out his wife. She then wanders sadly (just like Rekha! ), trying to get a job but the potential employer is too turned on by her for his wife to accept, then out on the streets in the dark all alone where she is quickly surrounded by a gang of rapists. An anonymous hero comes out of nowhere, fights them off, then urges her to pick herself up, love again, and in doing so prove to her similarly suffering sisters that there is light for them as well..."give them life in death." And she walks off with hero guy. What's going on here? The rest of the film is not particularly conservative in the typical Shashi-spewing-izzat sort of way, especially at the end, and this episode, while not directly modeled on any of the characters in the film, seems to set up the principle that some constrictive ideas (and values?) should be overthrown. It's also fun to see Laxmi Chhaya in this mini-arc; she doesn't dance, but she does emote like crazy. I also liked parts of the comic relief sketch in which Om Prakash's wife (didn't catch the actor) pretending to be under the spell of a love potion. Imagine pretending to be turned on by that. At least he has a useful hobby. and while still out in the country, Shashi-Amar and Rekha go on a perfectly posed picnic, complete with thermos. 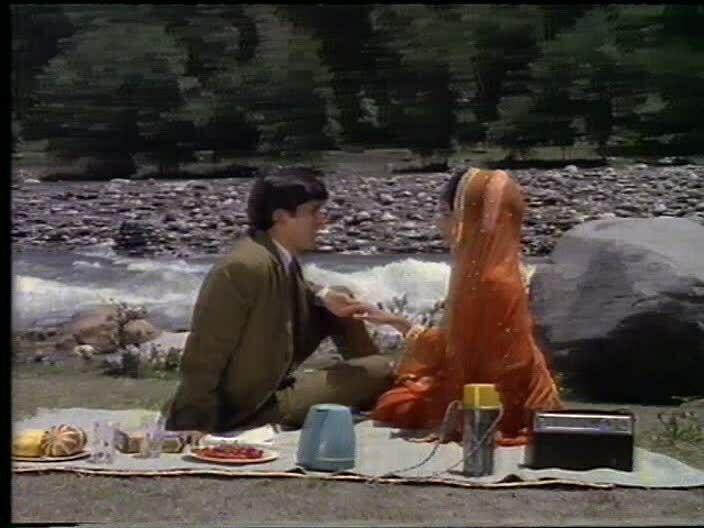 V Love Movies proposed to me that this idyllic scene actually bodes poorly for the couple; the blue kettle is for tea but the thermos is for coffee, signifying disagreements at breakfast every single morning. During one of the film's lighter moments, Shashi-Amar hides under a scarf to fool Dilip-Amar into thinking he's Lata as Dilip-Amar comes into the room and only sees the back of "her" head, and I gotta say, this is the prettiest woman I've yet seen from Shashi. 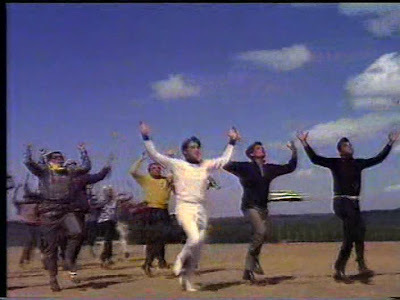 And to close, this film has two of my favorite Hindi film dialogues: "Yeh jhoot hai!" and "Yeh bhoot hai!" Lies, ghosts, mini-Asha, child marriage, and a reasonable, realistic ending - what more could you want? 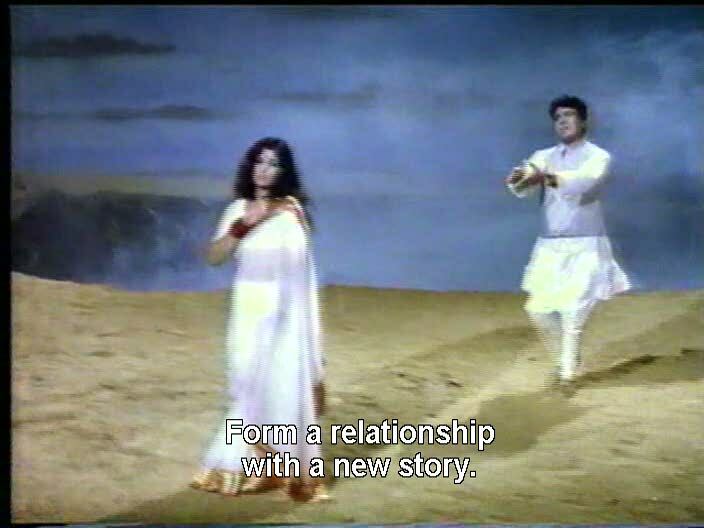 "I resent history for providing us with only two prime vintage Asha-Shashi pairings, both of which are in meh films." Isnt there an unreleased Shashi-Asha film lying in a can somewhere? I read about one recently (no NOT on my blog!) but cant recall the name, only that it had 'hearts' in it. In the ashtray song, Asha is telling Shashi that she is parayi, i.e., belongs to someone else, and that he shouldnt wait for her. 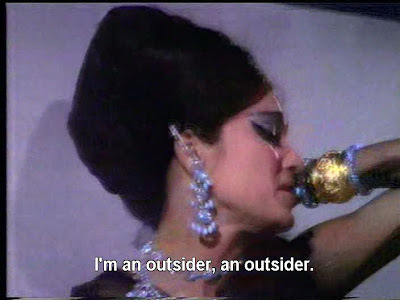 Not sure why parayi was subtitled as "outsider". Is this the only 70s film where a heroine has a MAA and the hero is completely Maa-less? No wonder the guy wants to do the unthinkable by wanting to marry an already-married woman!!! tsk tsk tsk... he clearly needs a Maa to put him back on the straight and narrow! What more could we want, you say? Almost - ALMOST - the juxtaposition of "Yeh jhoot hai" with "Yeh bhoot hai" makes me think fond thoughts about this movie. And you're right, it's refreshing when the Maa comes up with a common sense, intelligent response to the whole thing. But Rekha's initial response to her mother's suggestion is why this movie gives me the willies. Like, HELLO SHITHEAD! That's Shashi dying for love of you! And the other guy not only has a wife, that wife has a FREAKIN BABY. 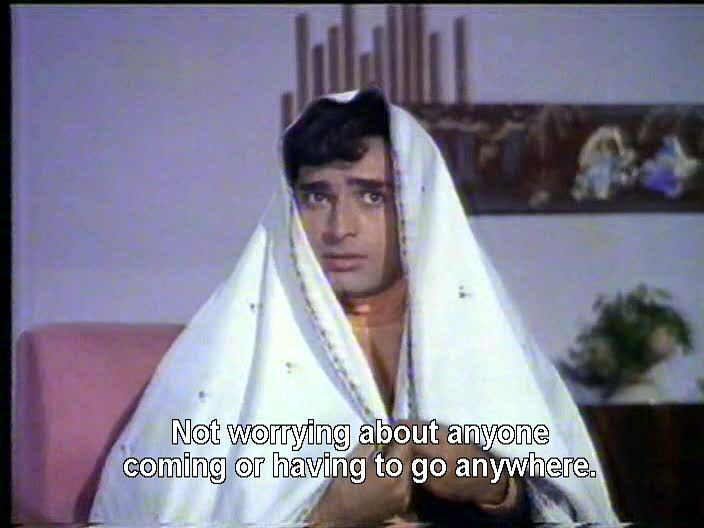 As a winged eyeliner veteran, I must see this movie just for that, and off course SHASHI! The trashier model's eyeliner is soo tacky thats not the wing goes! but i love the blonde wig to go with it! "the prettiest woman I've yet seen from Shashi." LOL, in Kabhi Kabhi he's prettier than Rakhi. 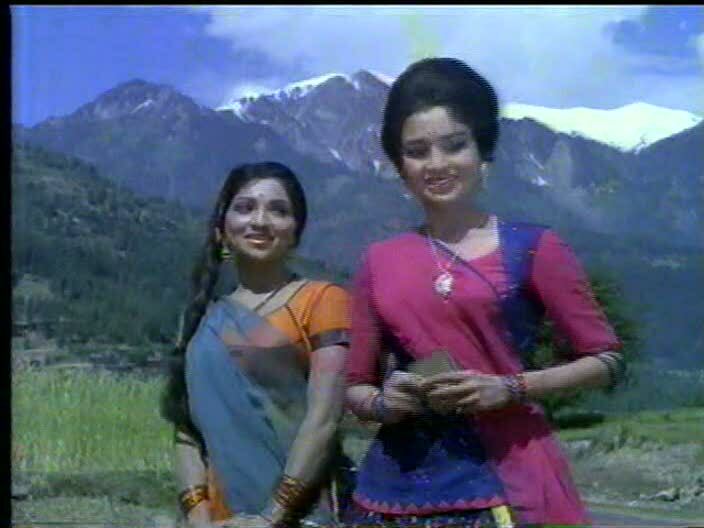 And what's it with Shashi heroines and cuddly farm animals. I was feeling 'meh' about it but then you had to go and give me the BHOOT pitch! Sold! Also, my Vintage Vinod films have begun arriving... *cackles evily* ... expect plenty of tight trouser shots for KHANNA-O-RAMA! Amey - I like it! It signifies a much happier ending. IS THERE an unreleased one? I hope so! I think they could be great together with the right project! That's a very good question re: MAA. He has no family of any kind and if I recall there's not even any real discussion of it. He's just blithely an successful poet orphan with a best friend of identical name! La la la! 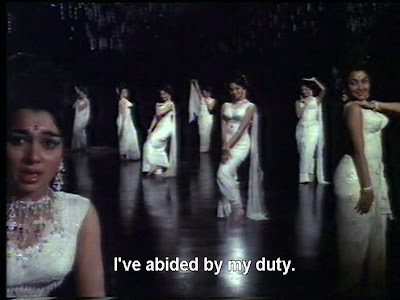 memsaab and Amrita - Yeah, I meant that sarcastically. It's by no means a perfect film but it had such a great ending that I can't not recommend it. Amrita, if I could convince film characters to give up values that I see as foolish or harmful, we'd have about 5% of our original stock of films left. Rum - You really must. I would send you pictures but all my screen caps are awful. You must see it to believe it. I'd say there's at least 1/4 inch difference between her lash line and the wing. V jarring. sophy - I think the baby farm animal thing needs to be researched. Right now I can only think of Shashi doing it in Jab Jab Phool Khile and Rakhee holding bunnies in Sharmeelee, but surely there are others! FG - No no do not rent it just for BHOOT! There is no ghost subplot! I repeat: no ghost subplot! I too have some vintage Vinod! EEEEE! 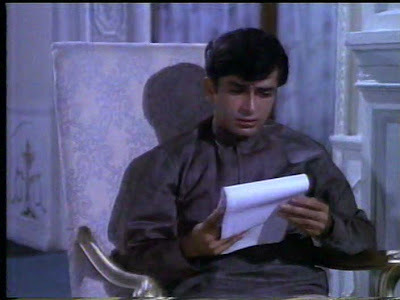 Actually, while Shashi has no family in the movie, it is mentioned that he was adopted, which makes the whole, I am your husband but I had forgotten about it (even though I am only pretending to be) a bit more believable, as those might be his birth parents rather than his adoptive parents. But yes, no living parents either for him or for his best friend of the same name. This movie was such a disappointment. I love Likhe jo khat tujhe and I ordered it just for that. I liked the way movie began, but Aasha was just too much! When her mother, being a generation older, could talk some sense, wonder what was wrong with her. I was waiting and waiting for the movie to finish and was glad when it finally did. I thought such sensible endings are not possible in Hindi movies! Padma Rani acted mostly in Gujarati movies and plays. She was a good actress. 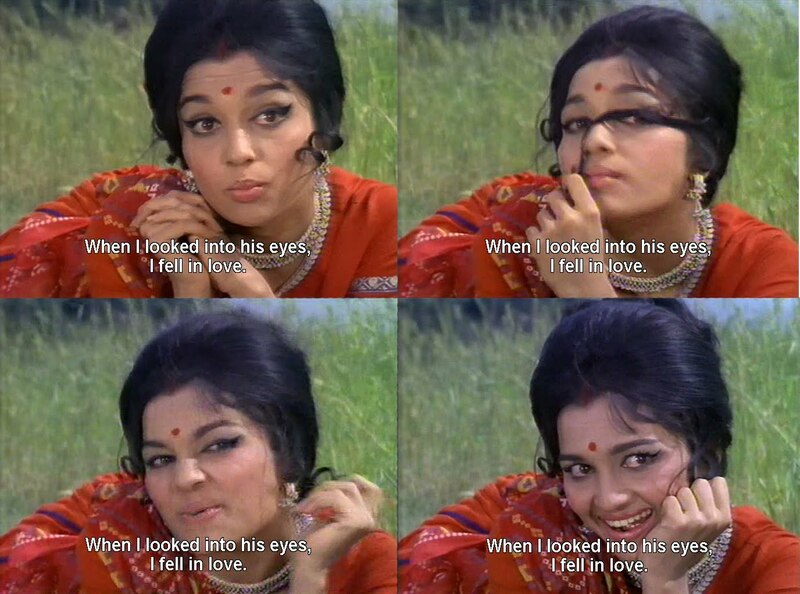 I remember her mostly for ehr role in a Amol Palekar TV serial Naqab, where she plays a nurse to an aging actor, who loathes her. This was allegedly an indian adaptation of an american novel, where an aging white actor is looked after by a black nurse, after he gets a paralysis attack. I was long time since I watched this movie. I remembered the whole movie while reading the reviews about it. Thanks a ton..I would love to watch this film once again.